Daniel Ayala scored a stoppage-time winner as unbeaten Middlesbrough went top of the Championship and ended West Bromwich Albion’s recent resurgence. Boro had dominated the match from start to finish, but had to wait until the 91st minute before Spanish centre-half Ayala eventually found a way through from close range. Middlesbrough had squandered numerous opportunities prior to that, with Martin Braithwaite most guilty when he blazed high and wide from inside the six-yard box. Ryan Shotton headed over and Stewart Downing’s fierce strike forced Sam Johnstone into a smart save – but boss Tony Pulis was not to be denied a victory against his former employers. 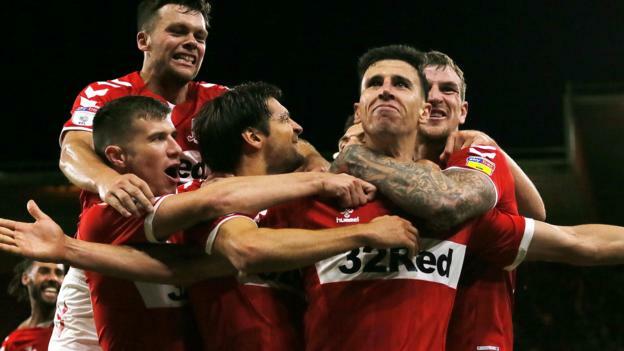 Boro have now won four in a row after drawing their opening league game, responding superbly to the disappointment of losing in the play-off semi-finals in 2017-18. They were rarely troubled by Darren Moore’s side, who looked a long way short of reproducing the attacking flair displayed in their 4-3 win at Norwich and last week’s 7-1 hammering of Queens Park Rangers. The closest they came to scoring was when Aden Flint smashed an awkward attempted clearance against the underside of his own crossbar. Despite enjoying 62% of the possession, the Baggies were at their most dangerous on the break – with Dwight Gayle wasting a two-on-one situation early in the second half. West Brom, relegated from the Premier League last season, remain in seventh after two wins from their first five Championship matches.